I just finished a big cup of hot herbal tea. Too hot, if you ask me. I have opened the windows, closed them and turned on the air condition. Is it hot? Is it cold? I have no idea, but I only know I wish it was colder. Something in the overall feelings of albums like the one I am now holding in my hands convinces me to yield to the cold realms that flow from the hands of these artists. ‘North Atlantic Drift’ is Mike Abercrombie and Brad Deschamps, and Northumbria is Jim Field and Dorian Williamson. Together they form six tracks of endless ice and cold winds. On “Vanishing Point” Northumbria brings crystallized guitar drones with icy distortion, creating a determined musical statement, manifested in heavy boulders and tall spikes. “Cold Vanishing Point”, on the other hand, is a more menacing tunnel of dark drones and cold winds. 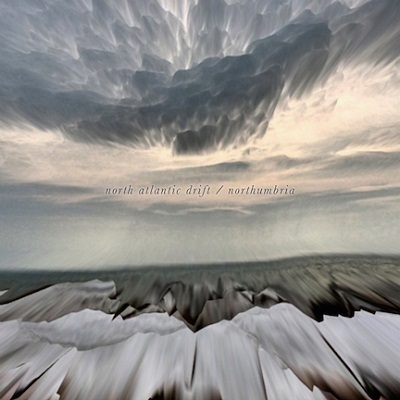 North Atlantic Drift offers a much a touching and more melodic approach, charging a gloomy current into beats that are somewhere between urban and polar. Maybe this is what the future brings; frozen cities and nostalgia. North Atlantic Drift and Northumbria’s self titled split comes in a really nice paper packaging, with artwork that gives another dimension to the chilly music.